More than 20,000 homes will be built under 15 affordable housing projects in Greater Klang Valley, Johor, Penang, Sabah and Sarawak. “These 15 new developments are under Phase 1 of the PR1MA programme. 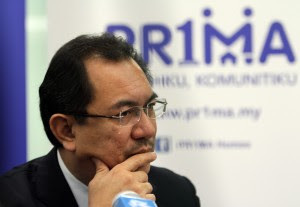 I am confident that by year-end, we will have more on board to meet the 80,000 homes as announced in Budget 2013,” said PR1MA Corp Malaysia CEO Datuk Abdul Mutalib Alias. Specifications of the 20,519 houses, including pricing and floor plans, will be announced in the next few months. Prices of the houses are below RM350,000, he said at a press conference yesterday. 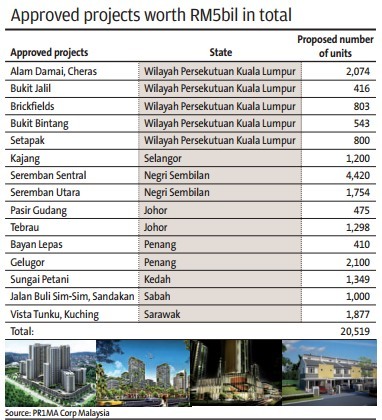 On top of the 15 projects approved, there are also plans to launch new projects in the next few months in Setapak and Jalan Jubilee in Kuala Lumpur, Bayan Lepas in Penang, two others in Johor Baru and one each in Sabah and Sarawak. Infrastructure work on three of the projects, namely Alam Damai, Cheras; Pasir Gudang, Johor; and Seremban Utara had started, said Abdul Mutalib. The units range from 1,400sq ft to 1,700sq ft for landed properties and between 670sq ft and 1,300sq ft for high-rise units. Buyers should be able to take ownership of the houses within 24 months for landed houses, and 36 months for high-rise residential ones from the signing of the sales and purchase agreement. Abdul Mutalib said it had received 250,000 registrations for the PR1MA houses and urged eligible buyers to register. He also cautioned interested buyers on scams involving fee collection by some quarters for the housing scheme application. “No fees are imposed on the registration of PR1MA houses,” he said. Eligible applicants aged 21 years and above, who do not own more than one property in Malaysia and have an individual or combined gross monthly household income of between RM2,500 and RM7,500, can apply via www.pr1ma.my.